Applications are now being accepted for positions on Standing Committees of CUPE Saskatchewan. In odd years, one (1) position on each Standing Committee is appointed for a two (2) year term. Any member interested in appointment should complete and submit an Application for Appointment (2-page form) by no later than March 31, 2017. 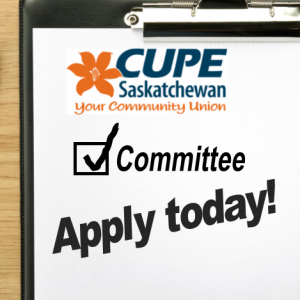 To be eligible for appointment, you must be a member in good standing of a local or Council of Unions chartered by CUPE and affiliated to CUPE Saskatchewan. Consideration will be given to those applicants who were delegates at the most recent convention. Appointments will be ratified at the April 11, 2017, meeting of the Executive Board. Goals and Objectives of Standing Committees are detailed in Appendix “C” of The CUPE Saskatchewan Constitution and ByLaws. If you have any questions or require clarification, please contact: Nathan at the CUPE Saskatchewan Office: 306-757-1009.